I’ve been composing, releasing, and performing cinematic sci-fi inspired electronic music for over a decade. Many tell me my music sounds like a soundtrack for science fiction film yet to be made. Some say my music would be perfect music for movie trailers. Others just like to jam out to it. To help further introduce you to to my music I’ve put this page together. Scroll down and enjoy. Wander the site for even more. If you are new to my music, use the player on the right to get a taste for some of my more popular tracks. If you enjoy it, take a moment to add some of my songs to your playlists and share links with friends. Continue down the rabbit hole by scrolling further down the page. If you like what you heard above consider streaming or buying my music to support the art. I have released 5 albums, multiple singles, and remixes for other artists – so there are hours and hours to choose from. This music is available on most major outlets. Don’t see your fav music app below? Simply search for “Mark Mosher” in your fav music service. If I’m not there let me know. Fear Cannot Save Us, which is a continuation of the science fiction themes from his earlier albums Reboot and I Hear Your Signals, but is also one of the finest classic electronic music albums I’ve heard in a while. If soundscapes are more your thing, you may want to check out my podcast Sonic Encounters now in it’s second season with many hours of music. Show notes are in the description section within each episode on Soundcloud. I perform live as both a solo and ensemble artist. Some Select performances include the University of Colorado Atlas Institute as a special guest of the Boulder Laptop Orchestra (College of Music), Music convocation at Gates Concert Hall at University of Denver for the Lamont School of Music, Grand opening of the University of Denver’s Performance Black Box; Galleria at the Denver Performing Art’s Complex as part of the Denver Open Doors city event; Mountain Oasis Festival Asheville as guest of Bob Moog Foundation; NC, Electro-Music Festival, NY; Electro-Music Festival Asheville, NC; Pacific Northwest Synthfest, WA; Art Institute of Sunnyvale, CA; Georgia Tech Guthman Musical Instrument Competition, GA; Midwest Electro-Music Experience, IN; and a special appearance at The Microsoft Store, CO.
I’ll be performing Saturday May 4th at 8:30pm at the Mountain Skies Festival at White Horse Black Mountain, NC. 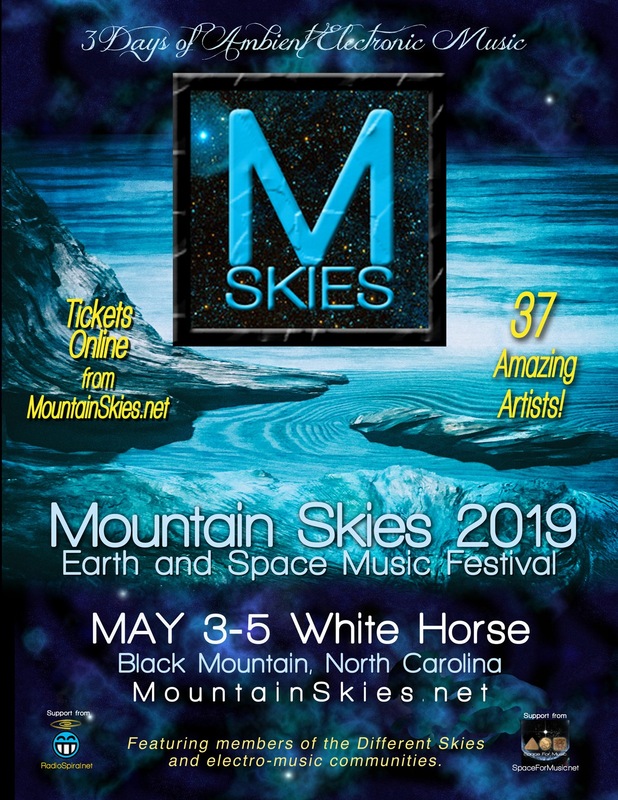 Visit http://spaceformusic.net/mountainskies/ for more info. Would you like to book me for a live concert performance or a concert performance + artist talkback? Use the form below to get in touch.